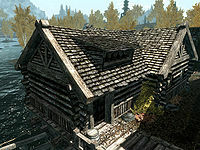 Honeyside is a two-story house in the northwest corner of Riften. This house, the second-least expensive home that can be obtained, becomes available for purchase during a quest for the Jarl of Riften. The quest can be started at the Fishery outside Riften; look for an Argonian woman, Wujeeta, working inside the Fishery. However, you need not contact her at the Fishery to start the quest since she can be contacted outside work hours to initiate the quest as well. 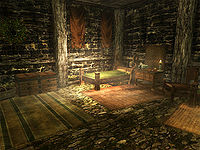 Note that the Jarl will not even mention selling the house until you have completed the associated quests Helping Hand, The Raid and Supply and Demand, and also built a reputation with Riften citizens by doing a few miscellaneous quests for the people of the town (see I Done Got Thaned! for details). Honeyside must be purchased from her steward Anuriel in order to complete the quest and receive the title of Thane of Riften. 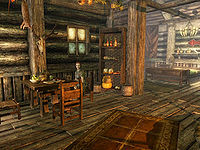 Alternatively, if you give Riften to the Empire during Season Unending or conquer it during Reunification of Skyrim, Honeyside can be purchased from Hemming Black-Briar without having to complete or begin the quests for the Jarl. Honeyside is a small two-story house, with access from within Riften and from the docks just outside the city. The house comes with a basic kitchen, bedroom, basement with housecarl's quarters, and a dock. A housecarl, Iona, will be employed when you have become a Thane of Riften. The garden will regrow after spending 30 in-game days outside of Riften and all its buildings including Honeyside. ‡ Child's Bedroom only available if Hearthfire is installed. Choosing this upgrade will replace the enchanting laboratory. You can switch back and forth between the Enchanting Laboratory and Children's Bedroom at will. Any outdoor containers (not inside the building) eventually respawn and delete anything that you may have placed in them. This includes the fish barrel on the deck. Some of the staged objects obtained when purchasing decorations can't be moved by you (such as forks). If Wujeeta dies prior to you completing the quest Helping Hand and starting the quest The Raid, then the only way to purchase the house is if the Imperials occupy Riften. This house has a unique back porch entrance which allows you to access the house from outside the city, which can be handy for avoiding guards while you have a price on your head. It's also incredibly helpful if you're encumbered and have a horse. You can hop on your horse, fast travel to the Riften stables, and then ride your horse right up to the back door for easy loot unloading. The three weapon plaques and four weapon racks can all be used to remove quest-marked weapons from your inventory. A copy of the Enchanting skill book Enchanter's Primer can be found on the table in the enchanting laboratory. Just fine, love. The weather here is wonderful, perfect for playing outdoors. Oh, fine! - If you want to bring up little pickpockets. This place is a terrible influence on a child. There are a few bugs which affect all houses, see the bugs section of the Houses page for details and fixes. Visiting the house for the first time before becoming a thane of Riften may prevent you from ever being able to be a thane, and you won't get a housecarl. Accessing the bookshelves in another home (e.g. 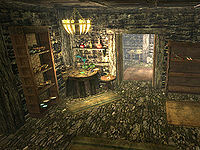 Breezehome) may cause the bookshelves at Honeyside to appear empty when activated. Any books that were inside the 'empty' shelf may have been deleted. Books can be rescued by removing them individually. Switching the enchanting room in Honeyside for a child's bedroom will cause you to lose any equipment stored on the mannequins. This bug is fixed by version 1.0.1 of the Unofficial Hearthfire Patch. Switching back to the enchanting Laboratory, all items remain on the mannequins, weapon racks and plaques and will be recoverable. When you buy the garden upgrade, the rest of the options may be removed from the steward's dialogue, making it impossible to buy any other upgrades. ? To avoid this, purchase the garden last when buying upgrades. Esta página foi modificada pela última vez à(s) 04h05min de 17 de fevereiro de 2016.